A word sketch is a one-page summary of the word’s grammatical and collocational behaviour. It shows the word’s collocates categorised by grammatical relations such as words that serve as an object of the verb, words that serve as a subject of the verb, words that modify the word etc. A word sketch negates the need for reviewing hundreds and thousands of examples found in the corpus one by one. Everything is displayed in a compact time-saving format. 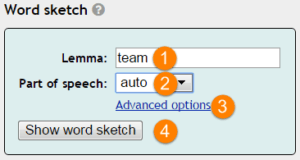 The following screenshot shows a part of the word sketch for team (noun) based on over 22,000 examples of use. The phrases in grey show examples of how exactly the word combines with its collocates. Clicking the plus (+) sign will display a multi-word sketch, e.g. 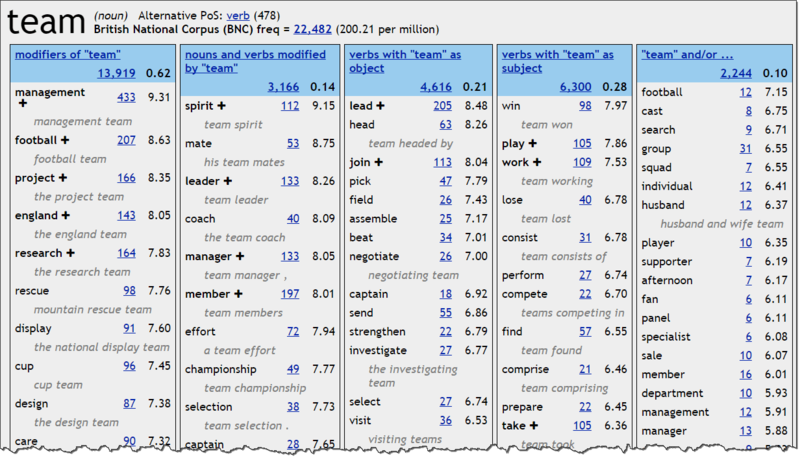 clicking lead+ in the third column will display a new word sketch showing how the phrase lead a team combines with other words. How to create a word sketch? Log in to Sketch Engine and select a corpus. Then, in the left menu, click Word Sketch to display the following screen. Try word sketch in our new interface! You can try typing a phrase (e.g. hot water). Note that if the phrase is rather infrequent, you may receive poor results or no results at all. You can also type several words separated by commas, eg. plane, aircraft and the resulting word sketch will combine collocations for all listed words. This is useful to see collocations for very similar words together on one screen. 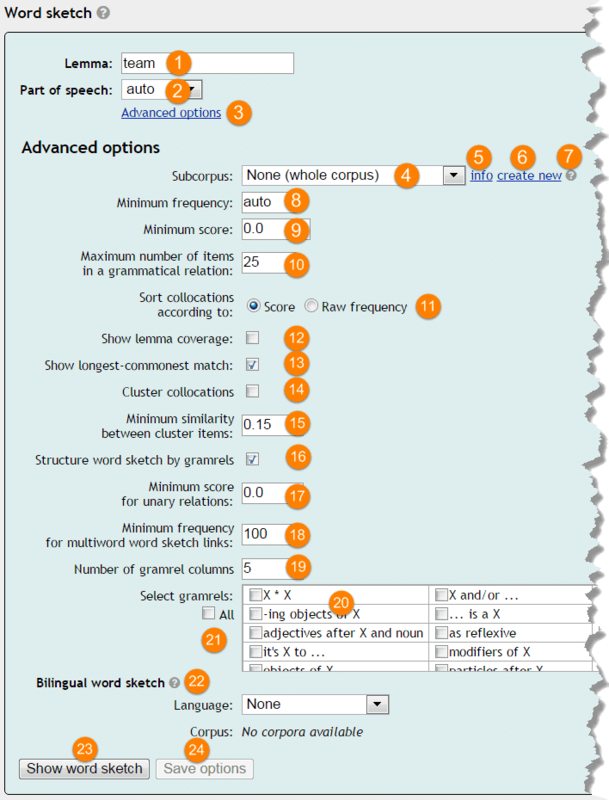 Also useful for languages or words with variable spelling where the corpus has not been normalised – listing all variants of the word will combine Word Sketches for each variant into one Word Sketch. (4) generates the word sketch. You should see a screen similar to the screenshot further above. The basic options are sufficient for most uses. However, more parameters can be set via advanced options (3). (12) displays a percentage indicating what proportion of the occurrences of the node appeared in a collocation, the rest were examples of the node in non-collocational environment, for example in a one-word sentence consisting of the node only. The description of the grammatical relation may not always be self-explanatory and at the same time, it is not easy to provide a full glossary of the relations because they can differ from one language to another. It is strongly recommended that the user clicks the frequency count on the result screen to display the actual example from which the relations can be easily inferred. There is a possibility to see the word sketch for multiword expressions. It is done by filtering word sketch according to particular collocates – e.g. you can show the word sketch for “water” filtered by the occurrences with “hot” as a modifier. If you make a regular word sketch and tick Show links to multiword sketches in the advanced options, you will see little arrows next to each collocation that will lead you to the corresponding filtered word sketch / multiword sketch.